Test Your Vocabulary provided by mahendraguru.com on daily basis to help the students who are aiming for the govt job, IBPS PO and Clerk, IBPS SO, RRB PO/Clerk, RBI, SBI, Insurance SSC-MTS, CGL, CHSL, State Level and other competitive exams. Vocabulary is an important part of English section that helps you to deal with all kinds of vocab questions in an objective as well as the descriptive exam. 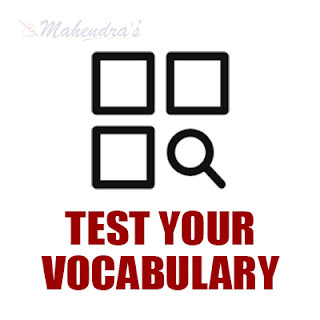 Test your vocab helps you to analyze your Vocabulary power and you can learn the new words daily from Test Your Vocab which include 10 new words. Most of you get confused with the synonyms and antonyms, of a particular word here is Mahendra Guru provides you to test your vocabulary ability so you can evaluate yourself and improve your performance to achieve your goal. Note down and memorizing the given words on regular it will definitely help you in an exam.